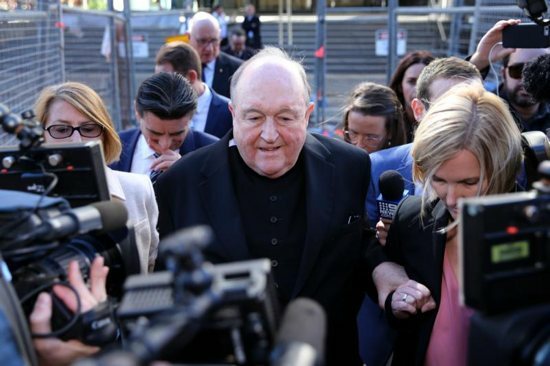 Archbishop Philip Wilson of Adelaide, who faces a maximum penalty of two years in jail for failing to inform police about child sexual abuse allegations, said he is disappointed at the court’s verdict. The local court in Newcastle found that then-Father Wilson had been told by a 15-year-old boy in 1976 that he had been indecently assaulted by a priest who later died in prison, but that Father Wilson chose not to go to the authorities despite believing the allegations were true. “I will now have to consider the reasons (for the conviction) and consult closely with my lawyers to determine the next steps,” the 67-year-old archbishop said in a statement after the May 22 publication of the 59-page judgment. The sentencing is expected in June.